The Day 6 Plotwatcher Pro is a camera that lives up to its name. It has no detection circuit, which makes its purpose be solely for watching plots and fields. Despite its lack of detection sensor, this camera still has features to offer which makes it a good tool for scouting plots. The Day 6 Plotwatcher Pro trail camera has a time lapse mode that lets you set intervals for as short as 5 seconds. Because of this, you will certainly not miss any action that will be happening in the field. Traditional game cameras also have the time lapse feature, usually measured in minutes. With the Plotwatcher you can take pictures every 2 seconds. When I spoke with a rep from Day 6, he explained the argument for fixed time lapse versus motion detection. According to him, a short time lapse (2-5 seconds), will ensure that you capture all movement through a specific area. With motion detection, you could potentially miss out on a lot of the action because of the range where movement can be picked up. As with most things, I wouldn’t say one is better than the other. It is a trade-off, and it depends on what your goals are. Taking photographs through time-lapse alone surely has some benefits. Because it is not dependent on motion to trigger it, you will have a broader range to capture. The performance of the camera will not be limited by the range of its detection circuit. 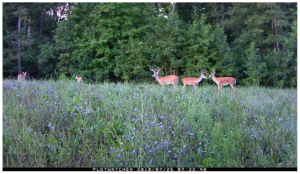 The Day 6 Plotwatcher Pro will capture the entire field, including those animals at a distance which is impossible with the conventional trail camera. This camera will still be able to take photographs of animals whether they are 10 or 250 feet away, compared to regular trail cameras that might only pick up animals within its 50 yard range. You will be able to determine what animal is in your field and where they are going. With this, you will be able to establish patterns of wildlife in your field without having to scout the entire area by yourself and with multiple trail cameras. In just a few minutes, you will get to see the big picture through this camera. The Day 6 Plotwatcher Pro is also easy to set-up because of its simple design. It has a 2.5 inch LCD screen for onboard camera setup, camera status messages, video aiming or support for an add-on zoom lens. It can also accommodate up to a 32GB SD card which allows you to store thousands of files in your camera. Plus, its battery life is three times more than most cameras, giving you more time to capture and scout your area. The Plotwatcher does not come with a flash, and can only be used from dawn to dusk. It lacks motion detection, for reason discussed above, and only works on time lapse. You do get an advantage from the camera using time lapse. Relying on motion detection can be dangerous, as the pictures will be severely limited by the effectiveness and the range of the motion detection unit. With this device from Day 6, you will capture animals at a far greater range than with traditional game cameras. It is highly unlikely that a regular game camera would have captured these bucks at this distance. Just one negative thing about this camera is that it stores the photos in video format which makes the captured object blurry especially if it is a bit far away. However, it is not entirely that unclear. You will still be able to determine what type of animal that is as well as its estimated size. All in all, the Day 6 Plotwatcher Pro is surely a good companion for scouting fields and plots. It may lack a detection circuit that most cameras have, but it makes up for it with its time-lapse feature. You surely will not miss anything, whether near or far, with this camera.